The bill was drafted in the wake of the Christchurch terrorist attack, when video of the alleged perpetrator’s violent attack spread on social media faster than it could be removed. The Sharing of Abhorrent Violent Material bill creates new offences for content service providers and hosting services that fail to notify the Australian federal police about or fail to expeditiously remove videos depicting “abhorrent violent conduct”. On Thursday the attorney general, Christian Porter, said Facebook and Twitter “should not be playing footage of murder”, in the same way that commercial television stations would not show it. Porter said a “reasonable” or “expeditious” timeframe to remove material would depend on the circumstances and be up to a jury to decide, but “every Australian would agree it was totally unreasonable that it should exist on their site for well over an hour without them taking any action whatsoever”. On that note, we are going to call it a day. Mostly because we know we have a big week ahead of us. Bill Shorten will deliver his budget reply speech tomorrow. The election can be called any moment on from there. Word from my Queensland spies, where the Coalition is basing its campaign, is shiz is just about ready in Coalition HQ. There has been a lot of movement in the past 48 hours, apparently, which would lend credence to the election being called this weekend. Most people are thinking Sunday, because it gives all the MPs time to get back to their electorates. There are a few holdouts for next weekend, but that seems doubtful. At this stage, Sunday for May 11 seems the most popular option. But we’ll see. It doesn’t really matter. We all know it is coming, and we all know it’s soon. Honestly, though, fixed terms people. Fixed terms. Moving on from that pipe dream, a massive thank you to Mike Bowers, Katharine Murphy, Gabrielle Chan and Paul Karp for dragging what was left of my mind across the line after the marathon budget lock up effort yesterday. And, of course, to the Guardian brain trust who come in and tidy up after me, as well as watch everything I can’t get to. And to you, for following along with us and keeping us company. We are almost through the 45th parliament. One more day of the House. And then – well, that’s a story for another day. We’ll be back early tomorrow morning. Take care of you. Scott Morrison just laughed at the replay of his Borat impersonation on radio. Scott Morrison is on 3AW – he says it is for voters to decide what the budget means to them. The Commonwealth Ombudsman has released its latest report into Centrelink ‘robodebt’. The Australia Institute has released some more figures on its tax cut breakdown. The Australia Institute has today issued a report modelling the distributionary effect of the accelerated income tax cuts, which reveals 54% of the tax cut benefits goes to the top 20% of income earners, while the bottom 20% receive a mere 3% of the benefit. 34% of the benefit goes to the top 10% of taxpayers, and more than half (54%) goes to the top 20%. Only 3% of the benefit go to the bottom 20%. The benefits also mainly go to high income males. For every dollar of tax cut that goes to women, two dollars goes to men. Meanwhile, the Low and Middle Income Tax Offset (LMITO) sees over 80% of the tax cuts go to middle income earners in 2019-20. “The progressive nature of Australia’s income tax system has been an important feature for decades,” said Matt Grudnoff, senior economist at The Australia Institute. “If the government is committed to maintaining budget surpluses, this radical reshaping of income tax will only lead to spending cuts in the future. Less spending on the services that Australians demand from their governments like health, education and aged care. “Flattening income tax reduces the tax take from high income earners, which ultimately means either less government services or high taxes on middle and low income earners if the government wants to maintain a surplus. “Flattening tax rates will see an executive on 5,000 pay the same marginal tax rate as someone on ,000 which is little more than the minimum wage. “Instead of addressing stagnant wage growth and rising inequality, this tax cut for the top end of town will only make inequality worse. Mathias Cormann, questioned by Patricia Karvelas on ABC, said the government didn’t fudge the numbers when it said it would cost .4bn to reopen the Christmas Island detention centre, but, as we found out in the budget papers, will now close in July for a cost of 5m. PK: Where is the discrepancy, did you make up that number? MC: No, not at all. The number was based on advice from officials. The decision to reopen the facility was based on advice from our national security officials. PK: That figure is way off? Is that figure wrong? PK: But it was already your decision? PK: Wasn’t that already your position? MC: No, we were acting – no, we made a decision in the context of this budget to close Christmas Island again on 1 July 2019 should we be successful. We previously made a decision to reopen it based on advice from officials. PK: Has a single asylum seeker gone to Christmas Island? MC: I suspect that in the context of the objective of the legislation, the fact that the government made a decision on advice to transfer any such asylum seekers to Christmas Island has perhaps reduced the level of enthusiasm to take advantage of that bill that Bill Shorten passed through the parliament. That is, of course, the precise purpose on why we made the decision to reopen Christmas Island. A quick update on the bill to force social media companies to take down abhorrent material. Despite Labor expressing serious concerns about the bill, including the lack of powers to jail social media executives, the opposition is set to wave it through. The government’s bill has been so rushed that it fails to fulfil one of Scott Morrison’s key promises – there are no powers to jail social media executives. On the prime minister’s own measure, it is a failure. You have to wonder whether he’s even read it. Labor has serious concerns that this bill has been poorly drafted and will not achieve its intended purpose. Let’s be clear – Labor believes that social media companies can do better and they must do better. What happened following the Christchurch attack must never happen again. Labor will not stand in the way of this bill, despite our concerns. A Labor government will refer this bill immediately to the parliamentary joint committee on intelligence and security for review, as would be the normal course of events if this bill had been given an adequate amount of time for consultation and scrutiny. Scott Morrison calls time on question time. There is one more left in the 45th parliament (most likely). But the Senate question time is done and dusted for this term (most likely). Dear Rihanna – Peter Dutton had to wait until an hour and 15 minutes in until he gets his dixer and, for a moment, I had completely forgotten he existed. Can the minister confirm that only a few weeks ago the government promised bn for the Emissions Reduction Fund over 10 years, but last night’s budget stretched the same amount of money over 15 years, included only 9m over the forward estimates? Doesn’t this confirm that the government’s budget con job has already fallen apart? I mean … we all know she is not going to answer the question. Is this really necessary? Can the minister confirm that the government gave almost half a billion dollars to a small, private foundation in a closed-door meeting and has now gifted m in environment funds to an institute cofounded by multinational oil giant Chevron which funds Chevron’s work in the minister’s own electorate? I thank you for the question. I will have to take that question on notice with respect to Chevron. I don’t have the information on that. … If I can take that on notice, thank you. What I do know is that we have a strong budget, we have a strong record on the environment and very proud of our announcements. That’s it. That’s the whole answer. And yes, she did include a talking point in there as what she did know. I mean, maybe there is something in the merit argument the government has been going on about, after all. There’s something missing in this video … I can’t put my finger on it, but I think it might have something to do with half of the population is not represented in it? The Budget is back in the black and Australia is back on track. My question is to the prime minister. With an election due any day and national unity on the rejection of racist hate speech never being more important than it is now, will the prime minister now direct every member of his government to put One Nation last? Speaker Tony Smith moves to rule the question out of order, on the basis that questions without notice have to be a responsibility of the minister. He says this one isn’t. The marginal/in-trouble MP dixer brigade continues. Lucy Wicks, Warren Entsch and Luke Howarth all get a guernsey. The prime minister has performed one humiliating budget backflip on the energy payment. His budget gives more than two million workers a tax cut of less than a week, while bankers and CEOs get ,000 a year. Why won’t he do another backflip today, give retail assistance cleaners and manufacturing workers a tax cut they deserve? Mr Speaker, on this side of the House we are proud of the fact in the budget last night 13.3 million taxpayers will be better off. We believe on this side of the House with lower taxes, we believe in lower taxes, people should earn more and keep more of what they earn. We believe we need a flatter, simpler tax system that remains progressive. Under the reforms we announced last night, the top 5% of taxpayers will continue to pay a third of the overall tax burden. The top 1% of taxpayers will increase their proportion of the overall tax burden under the reforms we put in place. Somebody earning 0,000 will be paying 10 times the amount of tax someone who’s earning ,000. Here in Australia, the top marginal rate of tax cuts in at 2.2 times average full-time earnings. In the UK it cuts a net four times. United States eight times. We have a progressive system in this place, and in this country, we are proud. We are also proud of the fact we return the people’s money, because it is not our money it’s their money, Mr Speaker. The Labor party believes you need to always charge with higher taxes. As expected, al-Jazeera did not start out investigating One Nation. They began investigating three years ago. But the One Nation leg only began last September based on a line in a newspaper how the party’s attitude to gun laws. Can the prime minister confirm then, in the last few weeks, his government did promise faster rail for Geelong, but last night’s budget failed to provide a single cent over the next four years to deliver the project? And that his 0m promise for Kakadu became Kaka-don’t without a single new cent in the budget? Doesn’t this prove that the budget con job has fallen apart? I thought that the Member for Grayndler understood how budgets were put together. Now he’s asking for funding for Kakadu. What he has obviously failed to see is that my provision was taken in but not yet announced, and when the money is put in that bucket of money, Mr Speaker, when it is put in as a measure in the budget, then the line item funding is entered. That means the funding is in the budget, all of the money is in the budget, and all the Member for Grayndler has shown is despite being here forever, he, like everyone else on that side of the House, has no idea how a budget is put together. No wonder they haven’t been able to find a surplus, Mr Speaker, they can’t even find their way around the budget papers! Michael McCormack just declares Damian Drum is living in the “age of infrastructure”, which, it has to be said, is no where near as catching as the new Japanese era, Reiwa. But apparently the age of infrastructure requires a lot of hand waving and yelling hallelujah. It also provides a chance for a power nap. I told you he did a Borat impression. Josh Frydenberg already sounds tired of talking about the budget. I would also like to thank everyone who messaged me to tell me that weird show I have fleeting memories was not a fever dream, but a show called T-Bag. I have no real memory of it, other than it was terrifyingly weird. The prime minister’s office has put out the transcript of the interview Scott Morrison had with Jon Faine from the ABC this morning. FAINE: Is it a moral fail to build an election surplus off starving the National Disability Insurance Scheme of money, leaving disabled people without the services they need? PRIME MINISTER: Well that’s a terrible lie, Jon. PRIME MINISTER: What you’ve just said. FAINE: What part of it? PRIME MINISTER: All of it. PRIME MINISTER: All of what you’ve said is untrue. Let me explain why. PRIME MINISTER: No that’s not right Jon. FAINE: What you yourselves said would be its allocated money and people are desperate for services and not getting them. PRIME MINISTER: Let me explain what happens with the NDIS. What happens is based on estimates that are provided by the states working with the commonwealth to understand what the expected demand is, then you pay out what the services are that are provided in response to that demand. Now, we overestimated the demand in the NDIS. That money actually shows up in extra expenditure on hospitals where a lot of those services are being provided through the state. So it’s just swings and roundabouts. FAINE: Well no, you’ve squeezed the pipe. FAINE: Mr Morrison, we’ve spoken to the providers, they do not have the cash flow allocated in order to meet the demand. PRIME MINISTER: We’ve just increased the payment and for providers. FAINE: For the future, but not for the past. PRIME MINISTER: That’s what’s been done. FAINE: Not for the past, hence the surplus. PRIME MINISTER: Jon I’m sorry, I’ve got to stop you there because you cannot tell those lies to the Australian people. FAINE: It’s not a lie. FAINE: [Inaudible] go, doesn’t it? FAINE: No, not every one that is sought. PRIME MINISTER: No, I’m sorry, Jon. I’m sorry, every demand for the NDIS is fully funded. There are no policy decisions in relation to the NDIS other than every single element of the demand is fully funded. What happens is if you get a lower demand on the NDIS, then you get higher expenses in the hospital system. And so these are the same patients and they’re getting the same support, they’re getting it through a different system. FAINE: No, they’re not. A lot of them are not hospital patients. PRIME MINISTER: I’m sorry Jon, you’ve got this absolutely wrong. FAINE: Prime minister, they’re not hospital patients, they’re not admitted, they’re not outpatients. PRIME MINISTER: But they are paid for through the health system Jon. FAINE: They’re not clients of hospitals at all. They’re paid through community organisations and charities and they need more money. FAINE: It’s not the Labor party, it’s the people who work their fingers to the bone for the disabled. PRIME MINISTER: You can do that, but if we’re going to have a debate, we can have a debate or we can have an interview. FAINE: Well we can have both actually, I’m trying to explore one of the major issues in the budget. PRIME MINISTER: And you’ve got it wrong, Jon. FAINE: All right well let’s move on to other things but I’m basing my beliefs not on what the Labor party have briefed us on. PRIME MINISTER: Well there’s an uncanny coincidence. FAINE: But the disability sector, it’s what the disability sector have put in their own press releases. Ross Vasta gets the next dixer. That would be the Ross Vasta who now has the Australian Christian Lobby doing mass emails for him. We have just experienced a summer of extreme weather events, one million dead fish in the Murray-Darling River and experts say on the current trajectory Australia has no chance of reaching its Paris commitments. Last night the federal budget did not take the opportunity to promote the role of renewable energy and promote leadership on the environment. Will you commit to strengthening environment laws and put forward a well-resourced independent national environment protection agency that would have equivalent powers to the national corporate regulator and the ability to impose a similar range of penalties? Our climate policy is awesome and Labor’s is terrible. Also a lot about Kazakhstan. And I would like to thank the prime minister for confirming I was right in a conversation I had with Paul Karp the other day, when they first started talking about Kazakhstan. I told Paul the PM probably just picked it because it was where Borat was from. In Kazakhstan, I am sure they are pleased about this. They are thrilled about this. Some may call this a carbon tax, Mr Speaker. I call it the Borat tax, with carbon … credits for Kazakhstan. I know what Borat would think of the Labor party’s thoughts on carbon trading policies. Very nice, very nice. He even does a Borat impression. There are not enough evens to can’t. Can the treasurer confirm that last night, hours after the budget was delivered, the prime minister and the treasurer had talks about changing the budget? Does this not confirm after six years of cuts and chaos the budget is a con job that is falling apart before our our eyes? What I can confirm to the House is that we announced a surplus. A surplus the Labor party never dreamt of. The … last time the Labor party delivered a surplus he had curly hair. I can confirm to the House last time Labor delivered a surplus I had a mullet. It is long gone now. God only created a few perfect heads and the rest he put here on. The reality is we have produced a budget surplus and we have provided assistance to those low-income earners, those people on a disability support pension, people on an aged pension, those on carer’s payment, those veterans, Mr Speaker, to ease the cost of living pressures, help them meet the next energy bills. You can only do that with a strong economy. Tim Wilson gets the next question, but does not ask what the definition of a “modern Liberal” is. This morning, more than 24 hours after delivering the budget, the government caved in to Labor pressure and backflips on energy payments for thousands of vulnerable Australians blowing an m black hole in the budget. Prime minister, doesn’t this just confirm, after six years of cuts and chaos, this budget is nothing but a con that has already fallen apart? Well, just a couple of corrections for the leader of the opposition. First of all, those payments were not in the current year, what we’re talking about is the 18-19 year. I know these things are a bit of a mystery to the leader of the opposition, but I can tell you why we are in a position to provide that one-off payment to Australians this year that was in the government’s bill introduced to the House this morning. Meanwhile most of the chamber seem to be acting like it’s a wet lunch on the last day of school. And if you never had to eat your lunch at your desk at school because it was pouring with rain outside, before sitting down on the carpet to watch some weird show you’ll have fleeting memories of, but think you dreamed until you meet someone who also remembers the woman who stirred the tea who was hunting the girl who had to find letters in some weird land, then I pity you. Scott Morrison answers by yelling us all to sleep. Nicole Flint gets the first budget dixer. You can pretty much pick who gets the dixers this session. Just think ‘marginal seat’. Is this a moral failure to build an election surplus by starving the National Disability Insurance Scheme of money? Leaving Australians with a disability without the services they need? It is fully funded under this government, 100% fully funded. What the member has put forward is a blatant and ugly untruth and she should withdraw it, Mr Speaker. I ask the minister for social housing to address the untruths she has spoken in this place. This is funding at a record level for disability. *Unless there is some miracle at the polls. There would be more, but those are the ones off the top of my head. We are on the downhill slide to question time. There is not enough vodka in the world. Start the clock – the final Senate day of sittings is almost over. Josh Frydenberg has also changed his Twitter background, but has chosen an image which just looks like one of the “in memoriam” shots the Oscar uses. Josh Frydenberg’s answer to Katharine Murphy’s question of, essentially: given all the policy switch-ups, what does the Coalition actually stand for? I think it’s always been core business for the Liberal party to lower people’s taxes, invest more in infrastructure, to put the skills in place for the workforce of the future. That is core business. And what is particularly core business for us is for the country to live within its means. Because that is a definition of “fairness”. If you keep running up budget deficits, you are basically handing the next generation an interest bill that will eat into the spending of otherwise important programs. You can’t fund those essential services of health and education, putting drugs on the PBS, the mental health package, the support for the respite care for carers. All of that can be done because you have a strong economy. So, I wouldn’t accept the promise of your question. I would say that this is a budget that grows the economy while being responsible fiscal managers. I think there is a lot in this budget for us to be proud of: the fact we’re investing significantly in our regions, the fact that we are investing in small business as the engine room of the economy – you won’t hear that language from those opposite. We are very much focused on small business and our regions and growing the economy. So, the reason why we were – have been – able to spend into those targeted areas is because we have been responsible managers over recent years. The fact that spending as a proportion of GDP is now down to 24.6% and it was 25.4% when we came to government, and it’s below the 30-year average, the fact that we’ve stayed well below our tax cap to GDP at 23.3%, the fact that we are eliminating net debt by 2030, the fact we have bn of surpluses, the fact we’ve turned it around by bn from the last budget, that’s our record. That’s our record. Some people might seek to write that that’s all by accident, some sort of commodity boom has delivered you this bonza on budget night. It doesn’t work that way. It actually works by having difficult decisions, negotiating with the crossbenchers in the Senate, going over the heads of the Labor party who have tried to stop us every step of the way, and the product is now a stronger budget for the people of Australia. And they will be faced with a choice at the next election. The choice will be very clear. You can sign up to Bill Shorten and 0bn of higher taxes and putting the unions in charge of the shopfront and the back office. Or you can vote for us. And we have delivered more than 1 million new jobs, trade agreements with the booming countries in our region, lower taxes for more than 13 million Australians, a simpler, flatter, more progressive tax system. That’s our record. And at the same time record funding for hospitals and schools and fully funding the NDIS and other important programs. The Labor party will talk a big game. But they won’t deliver it. We will. I think it’s very important that we alleviate some of these cost-of-living pressures, and we were focused on putting this additional m to work. This will secure the passage of piece of legislation through the parliament, and that is important as well. Because we want it to be in people’s pockets before the end of this financial year. That’s our commitment. There is no excuse not to pass it. Is it fair that someone on ,000 pays the same tax rate as someone on 0,000? The fact is someone on 0,000 under our plan pays 10 times as much tax as someone who’s on ,000. So the key point here is that we are incentivising people to stay in work, to work longer, to work more. Now, the progressive nature of our system sees the top 5% of taxpayers currently paying about a third of all tax. When our plan is fully rolled out, by ’24-25, that proportion that that 5% pays, actually increases. So the system arguably even gets more progressive under our plan. It also applies to the top 1% of taxpayers, paying more under our plan as a proportional over the overall tax burden. What we need is a simplified tax system, Andrew, and I think that’s what we’ve got. But certainly the low- and the middle-income tax payers will benefit out of this budget, and the fact in you’re in that 48 to 90,000 tax bracket, you’ll get the full ,080 in your pocket when you put in your next tax return. If you’re a couple, a teacher and tradie on ,000 each, you will get [just over ,000] in your pocket. If you’re on 0,000, you are not getting much. The question-and-answer section of Josh Frydenberg’s budget speech has just started. The first question: why wasn’t Newstart recipients included in the one-off energy assistance payment? Well, obviously the reason why Newstart was not included in those original suite of payments that people receive, and we are going to get the energy assistance, was because with Newstart, three-quarters of people move off it within 12 months. 99% of people who are on Newstart get another payment. They get a parenting payment or they get a family tax benefit payment, whereas when you’re on the disability support pension or on the aged pension, you tend to be on it for longer, and that seems to be –that is your principal form of payment. So, we excluded Newstart originally from it. Last night, the prime minister, the finance minister and myself discussed the issue. We thought it was appropriate to extend it. It is going to cost the budget an extra m because this payment will be out before the end of the financial year. That hits the numbers for the 18-19 year. It doesn’t affect the surplus numbers for 19-20. I think it’s obviously a prudent decision. It’s one that will produce for singles and 5 for couples from this additional energy supplement. To acknowledge they do face cost of living pressures and some of the energy costs – ease some of the energy costs. 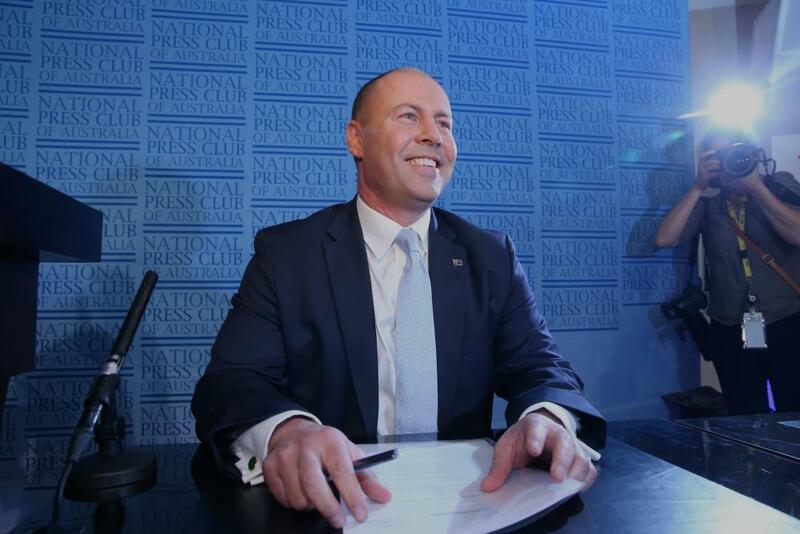 Treasurer Josh Frydenberg prepares to deliver the traditional budget day address to the National Press Club. It wasn’t just the tick. Our First Nations people have carried the consequence of murderous prejudice throughout our entwined history. First Nations peoples in Australia know what it is like to be powerless in the face of hateful prejudice, fanned by the illusion of superiority; and the false courage created by a weapon in their hand and their victims are defenceless. We know the impacts of murder wilfully carried out and morally justified by hatred of minorities, misplaced power and bullying superiority. In Gurindji country, they talk of the Killing Times. I have walked through some of the sites of mass murder in Australia with the descendants of the victims, and sometimes too with the descendants of murderers. In South Australia I visited a monument erected by both sides in the small community of Elliston to commemorate the mass murder of men, women and children pushed over the steep sea cliffs by charging horsemen and barking dogs. I have visited the sites of massacres, of mass murders in Balgo, in Forrest River, and at Coniston. At Coniston, near Alice Springs, those mass murders took place in living memory. I have sat down with old Warlpiri men and women who luckily survived those murderous attacks as young babies, hidden from the attacks. 1928 was not that long ago. My mother was just seven years old. But we are in 2019 now, and a mass murderer, rejecting the richness of difference, driven by religious hatred and xenophobia, empowered by military-style weapons, has waged his atrocity in Christchurch. In this Senate, we stand for common humanity, respect of religion and tolerance of life in all its diversity. We reject the scourges of racism, of bigotry and the kind of hateful violent murderous prejudice we saw at Christchurch. The murder of 50 innocent people does not just happen. It arises from the feeding of hate, irresponsible language and the demonising of people of colour, and difference. We know, and Senator Anning knows, the real cause of the bloodshed in Christchurch. The real cause was prejudice, hate and a passion for violent action, aided and abetted by the availability of military style weapons. The senator from Queensland, Senator Anning, warrants our censure. Through his words and his actions he has aligned himself with the most vicious form of ethnic and racial hatred. He is exonerating the murderous actions of a deranged and hate-filled killer. We turn our back against xenophobia, against hate crimes, against any gunmen who hold innocent people in their sights. Their values would plunge our country back into the Killing Times. We should instead turn our face to the light of a new future, a peaceful, non-violent, tolerant country of hope, respect and unity. A country where no innocent man, women or child is ever again the victim of mass murder. I say to those faithful mourning for their families in Christchurch: Allah yer’ham hom. I say to the people of New Zealand: o pouri mo to mate ka kaha. We are sorry for your loss, be strong. 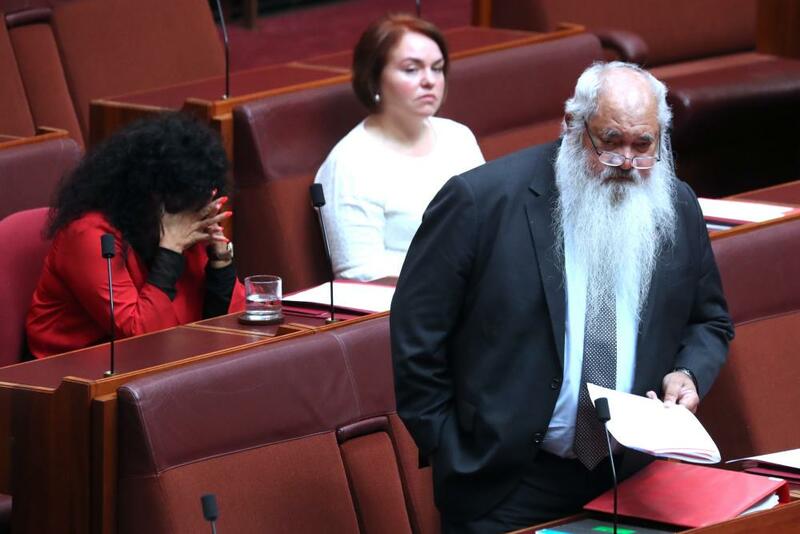 Pat Dodson makes a passionate speech during a censure motion against Fraser Anning. Josh Frydenberg will be delivering the traditional treasurer’s press club address in just a moment. Back in the Senate, Richard Di Natale is attempting to move a motion to have Fraser Anning suspended. It is going to fail – neither major party support it, with concerns it may be unconstitutional. As I mentioned a little earlier, the budget set aside about 4m over four years for the proposed federal anti-corruption body. It is well towards the lower end of what was promised by the government late last year. It is also well below the 0m per year that integrity advocates say is needed for a comprehensive, strong body with a wide enough remit to properly root out corruption. So anti-corruption advocates are underwhelmed, to say the least. The Transparency International Australia chief executive, Serena Lillywhite, told me that a poorly funded commission “could be worse than none at all”. “The resources need to be sufficient, secure and stable and not raided to fund other policy initiatives that happen to be political flavour of the month,” Lillywhite said. Ann Sudmalis is now delivering her own valedictory. She lost her preselection to Grant Schultz – basically, she announced she wouldn’t be recontesting after losing the numbers in her branch – who then lost the preselection to Warren Mundine in a Scott Morrison’s captain’s pick. Morrison is in the chamber for her speech. Just on the censure motion, it was passed on the voices. There was no “no” recorded in dissent. Brian Burston made sure to put on the record that One Nation abstained. Burston voted for the censure. Cory Bernardi then put on record that he opposed parts a, b and c of the censure motion, but backed d, which was the guts of the motion. Anning had left the chamber. And soon, will leave the parliament. Ryan MP Jane Prentice has delivered her final speech. She lost her preselection to her former campaign manager, Julian Simmonds. 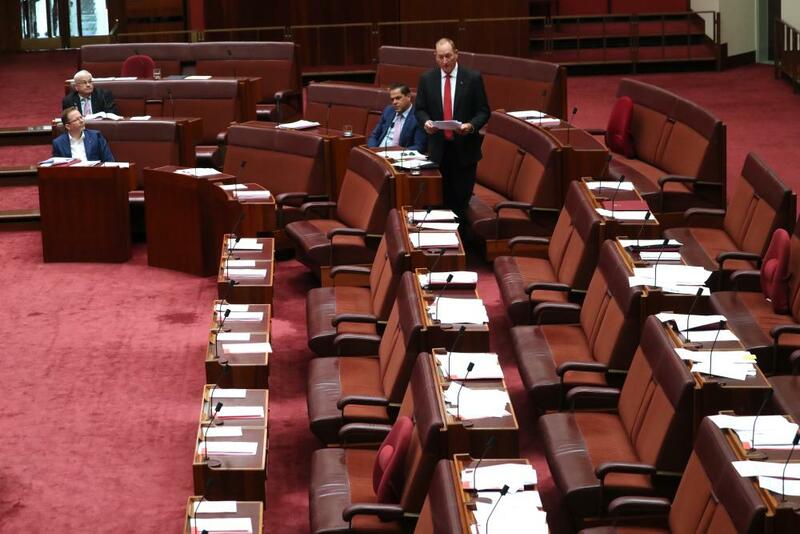 Yesterday, I tabled a petition signed by 1.4 million people, the biggest online petition in Australia’s history, calling on this Senate to remove Senator Anning from parliament because of his despicable comments seeking to further demonise Muslims in the wake of the Christchurch massacre and blaming the targets of this horrific terrorist attack for their own deaths. I received this petition on the International Day for the Elimination of Racial Discrimination and what fitting day it was to receive it, because if there is one politician that trades on hate, fear and division, it is Senator Anning. And, believe me, there is some competition. I know there is no mechanism to force Senator Anning to resign but the sheer number of people who signed this petition shows how strongly the community feels about those who seek to divide us and create an atmosphere of hate and division to further their xenophobic agendas. Surely the parliament must listen to those we represent and take action to make sure people are held accountable for what they say and do. Senator Anning well and truly crossed the line in here and out there a few times. He does not deserve to be in parliament. I have no doubt the community will make sure he is not re-elected in May and I will be doing everything in my power to consign his awful views to the history books where they are so clearly from and where they truly belong. There is no room for racism in Australia. Sadly, what Senator Anning said after the Christchurch massacre, however shocking, isn’t out of character. Just a week before I joined this place, he gave a speech calling for a ban on people like me coming to this country and for a white Australia policy. He even invoked the “final solution” in that speech. He has flown, business class, on the taxpayer dollar, I might add, to St Kilda to rally alongside neo-Nazi sympathisers. It is terrifying that far rightwing extremist groups have found a mouthpiece in federal parliament. I have often referred to these groups, and the politicians that support them, as merchants of hate. They prey on the anxieties of Australians with rhetoric that is empty, hateful and divisive. They whip up hysteria against minorities, against women and against Muslims. They thrive on problems, conflict and suffering. This is creating a dangerous environment for us all. How devoid of compassion and humanity is this Senator to, in effect, blame the fifty victims of this terrorist attack for their own deaths? How low can you go? What did three-year-old Mucaad Ibrahim do to deserve this senator? What about Hamza Mustafa who had just celebrated his sixteenth birthday? Senator Anning, you are an absolute disgrace, you should be ashamed of yourself and you should resign. The Senate votes to censure Fraser Anning, passing it on the motions. Anning, was not in the chamber. “You are a disgrace,” Sarah Hanson-Young says, immediately after the soon-to-be-former senator takes his seat. The biggest surprise here is that Fraser Anning can manage to still read his ridiculous speech through his cloak of victimhood. Fraser Anning is attempting to justify what he said, as well as claim that he is the actual victim. I could include what he is saying, but honestly, we all only have one life to live and there is no defence for what he said. Peter Georgiou hands were shaking so hard as he read that speech, which, as has been pointed out, followed the NRA textbook of attack, attack and then blame and attack. Cool speech, dude. Really nailed the mood. “Just because she wrote it for you doesn’t mean you have to read it out” Labor senator @AnthonyChisholm heckles One Nation senator Peter Georgiou. Peter Georgiou is reading a missive from Pauline Hanson (who is still suffering from a tick bite and is not in parliament). She, through Georgiou, refers to how Fraser Anning still received more first-preference votes than Wendy Askew, who replaced her brother David Bushby, and calls Greens senator Mehreen Faruqi a “token” replacement. Also, she totes supports Australia’s gun laws. But One Nation will not be participating in this “public flogging of a senator”. Because – freedom of speech, or something. Later in the day, Labor will attempt to wedge the Nationals and the LNP senators (those from Queensland) as part of a motion calling on political parties to put One Nation and other far-right parties and representatives last. While those Queensland MPs who sit in the Liberal party room have been directed to put One Nation (and others) last by the prime minister, the Nationals are holding the “let’s wait and see” line, combined with some absolute balderdash that the Greens are just as bad. So that will be an interesting debate. David Leyonhjelm’s former chief of staff, Duncan Spender, who has taken his place in the Senate for these final days, will be supporting the censure motion. Chris Bowen is holding a press conference on the government’s very sudden turn-around on the energy assistance payment for Newstart recipients (it’s almost like they realised they had left a voter group behind). I’ve seen a lot of budgets but I’ve never seen a treasurer deliver a budget on Tuesday night and have to explain on Wednesday morning how he got it wrong. Last night, the treasurer was justifying in TV interviews why recipients of Newstart and other important payments did not receive the energy supplement under his budget. This morning, he said they will receive the energy supplement. And this is no small matter. When we open the papers on Sunday, the big pitch from the Morrison government, the big sell from them as to why they all of a sudden get it, why we should ignore six years of cuts and chaos, that they understand the concerns of Australians doing it tough, and that they provide a one-off energy supplement. , we pointed out, is pretty small compensation for the Abbott-Turnbull government but we welcomed it. Yesterday my friend Linda Burney prepared a paper saying that Newstart recipients, the special orphan pension, the special widow allowance, the widow’s pension and the wife pension did not receive the energy supplement. Today, the government has introduced legislation for the energy supplement. The budget introduced – not last year, not last month, not last week but last night – says it, said it would cost 4m but there was no mention of Newstart and other payments. The legislation introduced today says that bill will cost 5m. A blowout in slightly more than 12 hours. This is just chaotic. It shows the government doesn’t get it and that vulnerable Australians are an afterthought for this government. Their other big song and dance is, of course, their tax cuts. We welcome the fact they’ve caught up with Labor on bigger, better tax cuts, but under their policy Australians earning less than ,000 is worse off compared to Labor’s plans. Take somebody on ,000, for example – not somebody on a high income. better off under the Shorten tax plan than the Morrison tax plan. So Australians doing it tough are an afterthought for this government. The chaos is real. The incompetence is real, but so are the values writ large and the difference of values between our approach and the alternative government. Cory Bernardi is still Bernardi-ing along in the Senate. I think he just asked if describing a senator as a “creepy old white man” is hate speech. No, senator. That’s a descriptor. Shockingly, Cory Bernardi is not supporting the motion, not because he supports what Fraser Anning said, but because of the term “hate speech”, which he says means “anything you don’t agree with”. Now, I do acknowledge the leadership that Senator Cormann has shown. I acknowledge and honour the words of Senator Birmingham yesterday and, just as I honour the position of so many good Liberals over the course of the decades in this country, Malcolm Fraser and many others sense, even John Howard putting One Nation last. I honour Mr Fischer. There are times in our history where bipartisanship has enabled us to confront racism and hatred, White Australia policy abolished, the Racial Discrimination Act, the confrontation of One Nation and its incarnation previously, the acceptance of Indochinese refugees despite community concerns in dealing with them, this was bipartisanship. It is a great sadness and I say this not as a partisan point, but as an Asian-Australian, it is a great sadness to me to see the way in which some on those side do not honour that history. It is a great sadness in me to see the way in which some on that side have failed to repudiate the ideology and the hate speech that we have seen in recent times. I would make the point that this senator who is being censured in his first speech argued for a return to the White Australia policy. It was abolished by Liberal and Labor governments. He also used a term associated with the Holocaust in a speech that didn’t reflect the Australia we know, built by people from every country from every part of the world, a strong, independent, multicultural nation. It is a sadness to all of us that many people, Coalition senators lined up and shook your hand. I suspect many of them regret that now. I think it was disappointing to see the motion, “It is OK to be white” be voted in support and it is disappointing to see by those opposite. It has been disappointing to see some government ministers prepared to fan prejudice for political purposes. I have in mind Minister Dutton’s targeting the African community and focusing on African gang violence and the way the Medevac bill has been discussed in response to paedophiles, rapists and murderers. Anyone who watched The Project interview would have understood, from Mr Morrison, would have understood I hope that what Mr Ali was saying that this is about how you frame the debate. Those who use or fan intolerance and hatred for their own political gain are not only doing the wrong thing, they’re actually harming our democracy in the process. So, today, I hope this Senate does censure this senator for his statement and, in doing so, we do take a stand against hatred and we are calling out hate speech. We are sending a clear message to the Australian people that people across the political landscape stand for values and principles that are central to our identity, Australian identity, and our democracy – inclusion, acceptance, respect and equality. And I hope that this moment that is Christchurch and its aftermath, can, in this country, generate a recognition of the importance of that occurring across the political spectrum. We’re about to go into an election campaign and the contest will be fierce, but there are some things which are above the political contest and this is amongst them. And if we do this, this makes our nation stronger at home and in the world. I want to briefly speak about this point. There is a difference between freedom of speech and hate speech. The former is a feature of our democracy. The latter is an attack on democracy. Let me explain why. A foundational principle of liberal democracies include foundational principles of liberal democracies include equality, justice and non-discrimination that all citizens are equal. All equal members of the community. And attacks which purport to posit a justification that some citizens should be treated differently is an attack on the principles of liberal democracy. There is a difference between the robust contest of ideas at attacking people of a particular group because of the colour of their skin or the nature of their faith and dehumanising them. A central element in the way prejudice works is by dehumanising, singling out people as outsiders, as second class, not deserving the protection and dignity afforded to the rest of us. It is why we say legislative protections and hate speech are so important. It is way, way on their side and others in this chamber fought so hard to defend 18C of the Racial Discrimination Act from attempts to repeal it. I recall Senator Brandis advocating its removal, stating people have a right to be bigots and I say that hate speech can’t be defended on grounds of freedom of speech because it is an attack on our democracy and it inflicts real and direct harm … We have to be uncompromising in our rejection of racism, prejudice, discrimination and hate speech and we must call it out wherever we see it. Penny Wong has finished her speech on Fraser Anning. We’ll get the video up. I recommend you watch it. It is heartbreaking just how many times this parliament has had to stand up to speak on racism and hate speech. It is 2019, and yet, we have to keep stopping proceedings to address the absolute vitriolic, dangerous and vile speech of some of our representatives. And today we as the Senate make another important statement, to take a clear stand against hatred and extremist ideology. In the aftermath of the Christchurch terrorist attacks, in the aftermath of horrific acts of hatred, while people were grieving, while the nation was grieving, the senator in this place made extraordinarily offensive and divisive statements. He blamed the horrific act of terror, of murder, not on the extremist rightwing terrorist, but on the victims of these evil acts. Families, friends, communities of those lost were still reeling from the shock, the senator blamed the victims. While those injured were being treated, this senator sought to further fan the flames of division. How pathetic. How shameful. Shameful and pathetic attempt by a bloke who has never been elected to get attention by exploiting diversity as a fault line for political advantage. Well, this motion makes it clear he doesn’t speak for us. He doesn’t speak for the Senate. He doesn’t speak for this nation. He doesn’t represent Australian values. This motion makes clear that the Senate repudiates in the strongest terms of this senator’s divisive statement and extremist ideology that either motivates it all which he simply wishes to fan. And this motion delivers on our responsibility as senators and leaders in our communities to stand against hatred, call out hate speech and advocate for the values that make Australia the nation we hope it will be. We must repudiate those who seek to spread intolerance and hate and in doing so undermine immigrant values. Mathias Cormann has just spoken on the censure motion on Anning. Penny Wong is now giving her support. 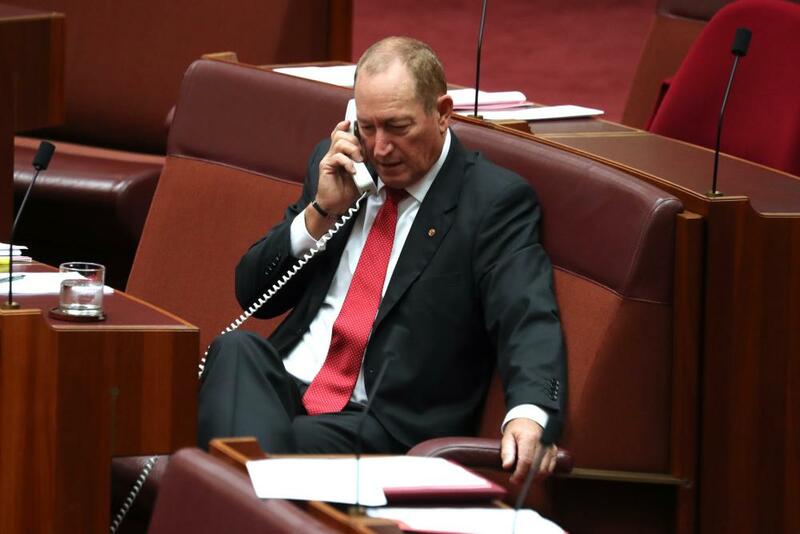 Fraser Anning, on his last day in this parliament, is, I assume, attempting to find a friend. Or a conscience. It’s hard to tell. Senator Fraser Anning as the Senate sits for what may be the last day of the 45th parliament in Canberra this morning. The budget has revealed just how much resourcing the Coalition plans to give it’s proposed anti-corruption watchdog, which it is calling the Commonwealth Integrity Commission (CIC). The attorney general, Christian Porter, had previously pledged to give the commission between 0m-5m over the forward estimates, comprising a m operating budget and additional money in its first year to cover operating costs. It was expected to have 150 staff. The proposed budget was slammed as grossly inadequate by experts and former integrity commissioners when the government released its proposal last year. Last night’s budget revealed the Coalition’s actual CIC budget is very much at the lower end of its proposed range. Subject to legislation, the CIC would begin in January 2020. It will have just 39 staff in its first year, according to the budget’s staffing projections. The total CIC budget over four years is 4.5m, including m in capital costs. Its operating budget in the first half year of operation is .5m. In 2020-21, its budget will be m, increasing to .9m and m in the subsequent years. So don’t expect the promised resourcing for some years yet. Even when it is fully resourced, the CIC will have fewer staff and a smaller budget than its state counterpart in Victoria. Its staffing and budget is in line with the NSW independent commission against corruption. The Australian commission for law enforcement and integrity, which will take on added roles and given a wider remit under the Coalition proposal, will be given just .2m in the current financial year for its troubles. The treasurer, Josh Frydenberg, on morning TV. The prime minister, Scott Morrison, sells the budget. Senate president Scott Ryan has begun the censure motion against Fraser Anning. The Senate is using its “contempt” power and, in a rare show of bipartisanship, Labor and the government are on the side of this, jointly moving the motion. The Greens and most of the crossbench are also on side. As far as we know, that bastion of bravery, Pauline Hanson, will be abstaining . The social media bill is also before the Senate today, and it is being passed at speeds so fast, you could be excused for thinking needles were being placed in strawberries again. I’m still not over the government just suddenly waking up and deciding to include Newstart recipients in the energy assistance payment, after leaving them out so conclusively, they were not even mentioned in the budget papers. And the Facebook post Julia Banks was referring to? The member for Flinders, when he was the Minister for the Environment, is the man who approved Adani. The member for Flinders is the man who was a prime mover in ousting former Prime Minister Malcolm Turnbull and deputy leader Julie Bishop. He’s the man who felt that with the member for Dickson they would make a great duo of leadership. In fact, his role in destroying our environment, in not protecting our environment, as the minister for our environment has been incredible. He is the man who lied to the leaders of our country, who lied to his local community, and he’s living a lie in relation to this issue. The people of Flinders feel their voice has not been heard and they are sceptical about the meetings which have gone nowhere and the sudden flurry of costly, meaningless pre-election flyers and forms designed purely to dataharvest and obtain contact details. That is not a real petition. That is to do data harvesting and write and send more flyers to people. The government of the day cannot shirk this responsibility, nor can it deny that it has the power to put a stop to the AGL development which the petition calls for. The Australian government’s specific role in wetland management and protection is established under the Ramsar convention, and the proposed facility is subject to this assessment process. The petition gives the local community a voice in Canberra, a powerful voice to tell the government that they want effective action to stop this development. As an independent I believe in the power of the people. Climate change action must happen. Climate change is not only real; it is happening. We’ve seen it in Flinders. We’ve seen it across our country. A strong independent will bring back the balance, stop the lies and stop the empty words. I am very slowly getting through the Hansard from yesterday, but this speech from Julia Banks is also very interesting. You may remember the former Liberal MP for Chisholm is challenging Greg Hunt in the seat of Flinders as an independent. She raised some issues overnight on a gas project in that electorate – where climate change is very, very important to voters. In the seat of Flinders, there is a proposed project by AGL. The project is this: a floating gas import facility on Western Port Bay at Crib Point, a beautiful part of the world. Concerned locals formed the Save Westernport group. They have worked tirelessly, including consulting both the major parties, to stop this project to build a floating gas import terminal on Western Port Bay. This floating terminal will be capable of importing liquefied natural gas from ships in Western Port Bay. Every time a shipment is delivered, the process would mean taking in sea water from the bay. The water, equivalent to 180 Olympic swimming pools a day, would be chlorinated, chilled and discharged back into the sea seven degrees cooler. An extension of this project is a 55km pipeline proposed from Crib Point Jetty. This pipeline would cut through internationally significant wetlands, private properties and Melbourne’s food bowl. The Labor party are supporting this and whilst their local candidate in the seat of Flinders sought permission from his party to say he doesn’t like it, and he said this on a Facebook post, this is just that: words on a social media post that will probably find their way onto a few flyers. No way can he fight the major-party machine. He’s just saying he doesn’t like it. Nice try. Worse than that is the local member for Flinders, also known as the minister for health, also, remarkably and staggeringly, previously known as the minister for the environment. He has suddenly also done some Facebook posts and handed out flyers saying he’s done robocalls – and he’s blaming Labor. ‘Stop AGL’s project,’ he says. There have been town hall telephone calls and he’s issued incredible numbers of documents, again, at taxpayers’ expense. On the side, he has said quietly to the Save Westernport group – that care passionately about this issue – that there’s no way the Save Westernport group are going to succeed here. b) only looking after the top end of town and treating vulnerable Australians as an afterthought. Penny Wong is outlining Labor’s plan for the day, which includes supporting some government bills to make sure they are passed before the Senate rises for the final time. But she diverts to ask John Williams why the Nationals are still supporting One Nation. “Show some leadership!” she says to Wacka, pointing at Fraser Anning (who started with One Nation) saying Williams should be working to follow Ron Boswell’s example, and commit to putting the party last. Scott Morrison also reconfirmed Bill Shorten would have the opportunity to make his budget reply speech – meaning the election will not be called until after Thursday. Scott Morrison was on ABC Melbourne radio as part of his budget/election sell this morning, and I think the man might need a coffee. He did not seem to be having a great time with Jon Faine. “Well I want to see it passed through the parliament and that is what is going to happen,” he said. 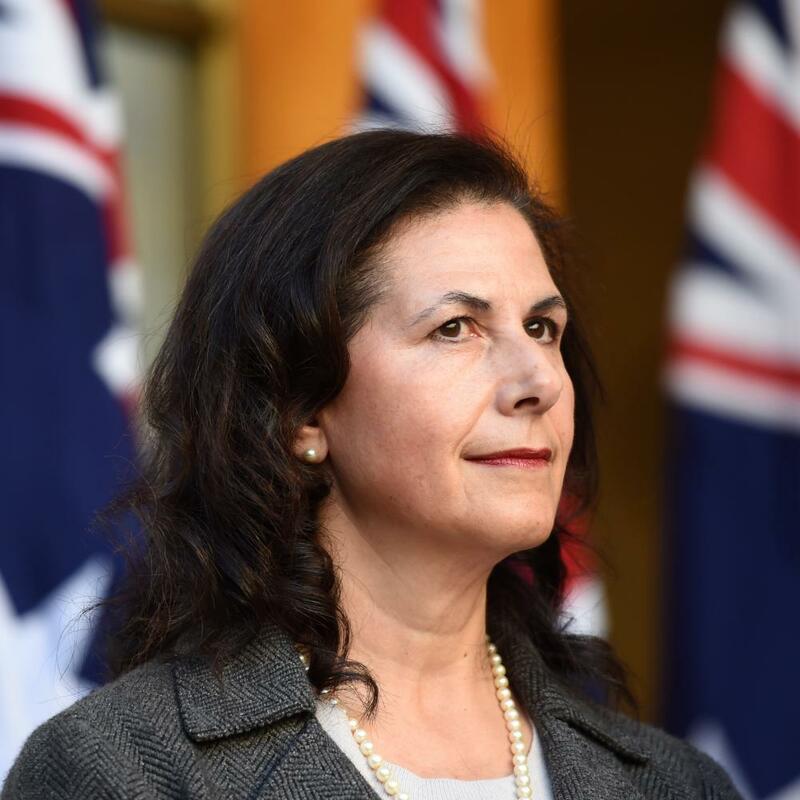 Claire Moore was the first senator up after Concetta Fierravanti-Wells’s speech. Lastly, I note that United Voice, the Australian Education Union and Greenpeace are now running high-rotation pro-Labor anti-Coalition ads on Sky. We will see if Sleeping Giants Oz goes soft on these advertisers, like it did by omitting the Australia Institute from an earlier Sky advertisers list. The second disturbing development I outlined last year involves another influence campaign being conducted via Twitter to the benefit of the Australian Labor party. This campaign spreads misinformation and political spam via a large web of mainly anonymous and also automated Twitter accounts which churn out similar, if not identical, pro-Labor, pro-union, anti-Coalition content, creating an echo chamber of reinforcing noise. I identified nine such accounts. One narrowly missed the cut because it just didn’t tweet as much as the others – and get cracking, Alan – and was called JohnWren1950. Last week, Twitter permanently suspended this account for impersonation, after John Wren posted a fake memo purportedly from the Department of Prime Minister and Cabinet, using its letterhead. Wren’s devious post – putting this obviously fake memo into the public domain under the ruse of wanting to confirm its authenticity –was a crude attempt to foment fake news. Wren is now wallowing in his petty notoriety, penning a paranoid self-justification for Independent Australia. He exhibits the remarkable facility of the left and those trolls I mentioned in my last speech of simultaneously complaining about being called out and, in doing so, verging on paranoia while basking in their 15 milliseconds of fame. Witness Sir Clyde Of Nob, now dubbing himself “Lord Clyde Of HANSARD”, while Big Al now styles himself as “BigAl of Hansard fame but not a bot”. The trolls I did mention and their apologists think they ought to be able to flood the Twittersphere with bile and bosh but escape scrutiny and then cry that they are being suppressed. They are truly legends on their own laptops. Even more revealing is their common misrepresentation – possibly due to illiteracy, but I suspect deliberate – of my speeches on these subjects as suggesting these Labor trolls were actual Russian bots when I was clearly just noting the similar methods used in their influence campaigns and the danger of both in the lead-up to the upcoming election. But proving that truth is stranger than fiction, a recently released dataset of Twitter accounts identified as being from the Internet Research Agency, the infamous Russian troll factory, disclosed one account that, in late July to early August 2017, twice tweeted directly to the Labor troll virgotweet. So here we have a Russian internet research troll talking directly to a Labor troll. This IRA account that purports to be located in the United States predominantly retweeted Australian politicians and political commentators but notably twice tweeted virgotweet directly, suggesting this account was identified as a potential vector for pushing a specific agenda or debate. It shows the risks, even for domestic trolls, of disseminating fake news and propaganda. The Australian public should be conscious of the distortion of political sentiment via social media channels, especially as the public and media frequently use Twitter as a barometer of public sentiment. Again, I call on Twitter to review accounts like those I have identified, which degrade its own platform. Australians should be able to engage with the upcoming election campaign free from domestic as well as foreign social media interference campaigns. Last year, I informed the Senate about two disturbing developments in political campaigning by the left. The first concerned an anonymous Twitter campaign called Sleeping Giants Oz, primarily directed at Sky News by the Australian offshoot of an American online activist group. Followers are encouraged to identify so-called hate speech and send a screenshot of that content to advertisers next to their ad to discourage them from advertising with that media outlet, often with the threat of consumer boycott. I noted that such campaigns crave anonymity because they don’t want to be exposed as being politically inspired. But, more importantly, they rely on deceiving people – in this case, advertisers – about their real level of support. In this connection, a recent Brandwatch report confirmed that Sleeping Giants Oz’s campaign is being driven by a small group of people. It is confected outrage originating from less than 32 accounts throughout the duration of 2019. Activity mostly involves retweets, giving the false impression to advertisers who are targeted that there is a major boycott campaign in action when, in fact, the opposite is the case. Brandwatch found that Aushiker, a Twitter account operated as a pseudonym by Western Australian lecturer Andrew Priest, was the most engaged in Sleeping Giants Oz campaign. It was responsible for about 43% of activity across the top 10 most engaged accounts between 1 January and 21 February. Aushiker’s Twitter account now bears the description ‘My Tweets scare the Government #NotABot’. Talking of bots, many accounts, including Aushiker, use and engage with third-party applications revealed by the tweet source label on their tweets. These third-party applications are designed to manage Twitter accounts, including scheduling automated tweets. For example, Aushiker’s tweets are posted via Buffer, an application designed for businesses to improve social media management but now utilised by leftwing trolls. Fraser Anning will be censured today. The soon-to-be-departed Queensland senator had a little bit of a whinge in Senate question time yesterday about not being able to say what he wanted, and claiming he was the victim of “an attack” – that would be the egg. Simon Birmingham slapped him down. My question is for the minister representing the prime minister, Senator Birmingham. In a liberal democracy, free speech is a fundamental pillar which promotes open public discourse. However, it has been reported that the prime minister has said that my views have no place in Australia, let alone the Australian parliament. When I was recently the victim of an attack, the prime minister said that I and not my assailant should face the full force of the law. Does the government stand by the comments of the prime minister? Emphatically, yes. With every right come responsibilities, and with the right to freedom of speech is the responsibility to use it in a way that brings harmony to our society, that brings peace to our society and that is reflective of the broader values of our society. Senator Anning, through you, Mr President, the way in which you have conducted yourself in the time since the massacre occurred in Christchurch – that terrible tragedy that this Senate and the other place came together earlier today to reflect upon, to mourn and to pay respect but also to strongly condemn the actions of a violent madman who undertook that – betrays the rights you have to freedom of speech and shows a lack of responsibility in the way you have conducted yourself. The lack of compassion you have shown demonstrates, frankly, a basic lack of basic humanity. Lives were lost, families were ruined, a community was devastated and, rather than rightly reflecting upon the terrible act that occurred and the loss of life that occurred, you instead acted in a way that was inflammatory, that was divisive and that, indeed, fuels, potentially, further acts of terror and violence. In doing so, Senator, you have shown a reckless disregard for your fellow Australians and many others around the world. In doing so, you have failed the test of character I would expect of anybody who is elected to this place. So, yes, Senator, we all have the right to freedom of speech. However, indeed, we should all exercise that right with the type of responsibility the Australian people expect of anybody elected to this place. If the government considers that someone striking me with an egg is acceptable but my opinions and defence of myself are not, at what point will such attacks be condemned? I condemn, the government condemns and I am sure every one of the 75 other senators in this place condemns any act of violence against any individual. But, Senator Anning, to seek to compare the act that occurred, an act of protest in relation to an egg, with the comments you had made in relation to the loss of life that happened in Christchurch, is an appalling comparison to seek to make. Of course everybody ought to uphold the law. But everybody in this place ought also to be able to show some leadership. Not only did you fail in terms of showing responsibility and thought around the freedom of speech that you carry as a member of Australian society, and, unfortunately, as a member of this Australian Senate, you also failed, indeed, to understand the relativities of the types of circumstances you were dealing with. Based on your answer, is it not the case that it is the government’s position that politically motivated violence is acceptable in circumstances where the cause is sufficiently worthy – that is to say, where the ends justify the means? I refer you to my previous answer. Of course, this chamber will tomorrow deal with your actions through a bipartisan censure motion. I acknowledge and thank those opposite – and I’m sure those from elsewhere in the chamber– for their support that will come in relation to that censure motion. We also trust that the people of Queensland will deal with you as you deserve to be dealt with at the next election. Estimates begins tomorrow – with the election expected to be called at any moment, Labor and the Greens wanted the chance to scrutinise the budget, so they accelerated the timetable back in February to make sure they got a chance to hold at least some hearings. Which makes today the last Senate sitting day. A 6.2m promise to revitalise Kakadu national park, including m to remove asbestos from the struggling township of Jabiru, has been put off until at least 2023. Prime minister Scott Morrison made the funding announcement on 13 January, the same day that Labor announced a 0m package for Kakadu ahead of a planned visit by Bill Shorten. The Coalition’s promise includes m for key roads; .2m toward the Kakadu national park tourism master plan, including improvements to wifi and mobile connectivity; and m towards building a new Kakadu visitor centre; as well as the m for Jabiru. The program was listed in the budget as occurring between 2018-18 and 2028-29 but none of the funding was allocated over the four-year forward estimates. At a press conference announcing the funding, Morrison said he had found the money for Kakadu following the midyear economic update and would go toward Jabiru transitioning toward a tourism-based economy, with the forecast closure of the uranium mine in 2021. He also said, following questions from journalists, that the program would be delivered over 10 years and did not provide details on timing. The Jabiru town lease is tied to the mine and traditional owners are concerned both about the future of the town and about asbestos contamination, which has led to students being sent home from school. Labor promised it would spend 0m on Kakadu if elected, including 0m on upgrading access roads, m for asbestos remediation work in Jabiru – a program it said would take 10 years – and m for a new visitor centre. Labor has not said when its promised funding would be delivered. 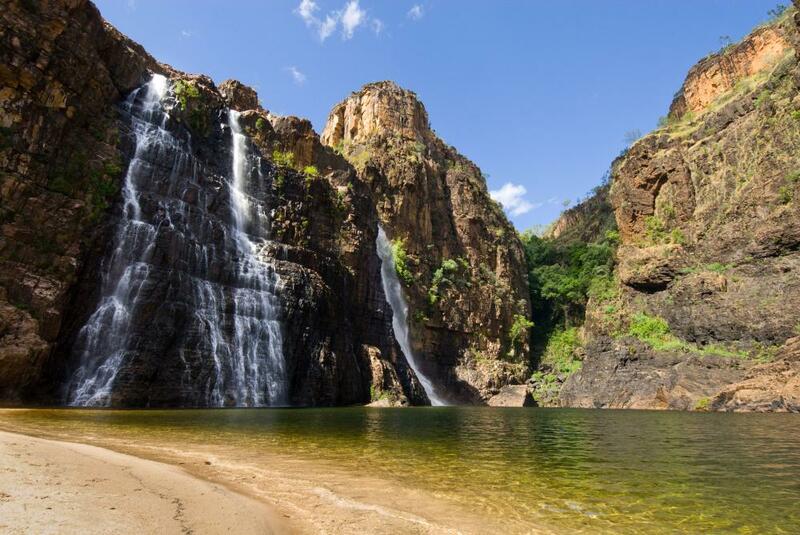 Twin Falls in Kakadu national park. Bill Shorten is scheduled to deliver his budget-in-reply speech tomorrow. A lot of Labor’s policies have already been announced, but this looks like it will be the flavour of the reply.
.@Kieran_Gilbert: Your commitment is to deliver larger surpluses across the forward estimates?
. @billshortenmp: Whoever people vote for, they’re going to get the same tax cuts but we will pay down debt, fix wages and take action on the climate. One of the biggest criticisms of the budget is that, for the 25th year in a row, there has been no raise, in real terms, to Newstart. Given everyone from the Business Council to the social services groups have been talking about the need to increase it this time round, it seems the government has had a last minute about-face and decided to include Newstart recipients in the one-off energy assistance payment. “What I can say is we will be applying to Newstart recipients, the energy supplement,” Josh Frydenberg said to ABC breakfast this morning. When he was asked about it on AM, Frydenberg said the same thing. Asked if it was new, he said “yes”. So, yup. It is new. Because, for the people up the back, it was not included in the budget papers. 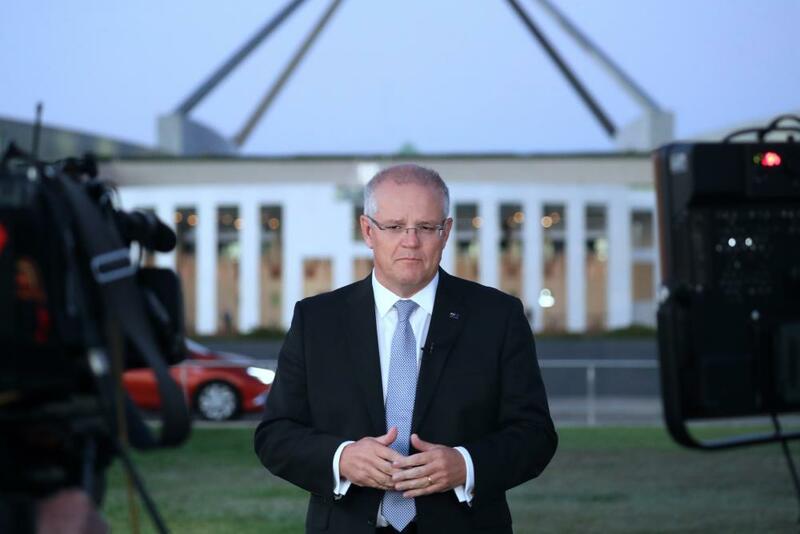 Scott Morrison, chatting to ABC Breakfast this morning, says he doesn’t believe Australians are worried about how many prime ministers the Liberal party have had since coming to power. I think that’s what the bubble worries about, but what Australians are going to decide … No, what they’re going to do is decide who is going to lead the country for the next three years. 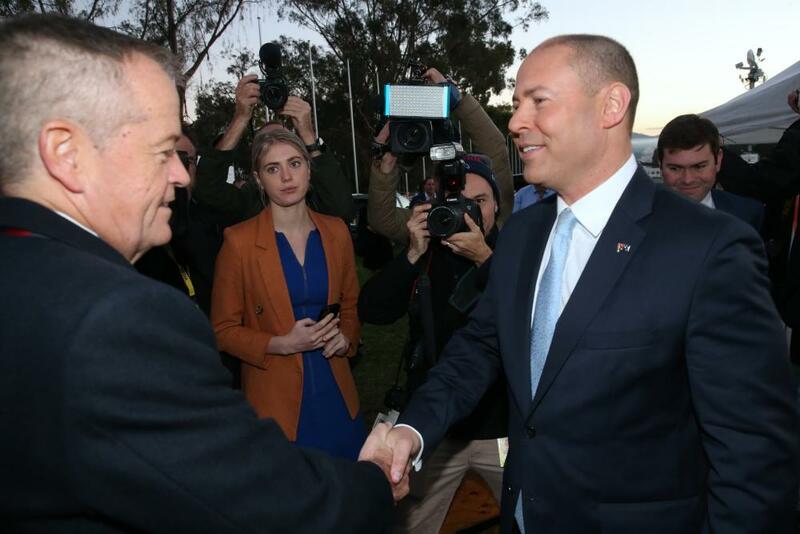 Be sure about this – there’s a choice, myself as the leader of the Liberal party together with the Nationals to lead the country for another three years and keep our economy strong and secure our future, or you can have Bill Shorten and the Labor party with higher taxes. You vote for Bill Shorten, you’re guaranteed Bill Shorten. You vote for me, Scott Morrison as prime minister, you’re guaranteed me. The choice is about the future. The choice is always about the future in an election. And our future, the economy that we will continue to lead, is one where Australians will have better opportunities, higher wages, more growth, more employment, a better future and stronger services. Scott Morrison has started the morning by being asked about the budget surplus – with the government claiming it’s “back in the black” complete with a social media campaign – but that surplus doesn’t come in until the next financial year. “Because the budget is back in the black … that’s what a budget is, it’s for the next financial year. And it’s taken us 12 years to get here,” he told Sky News, who chased him down outside parliament. 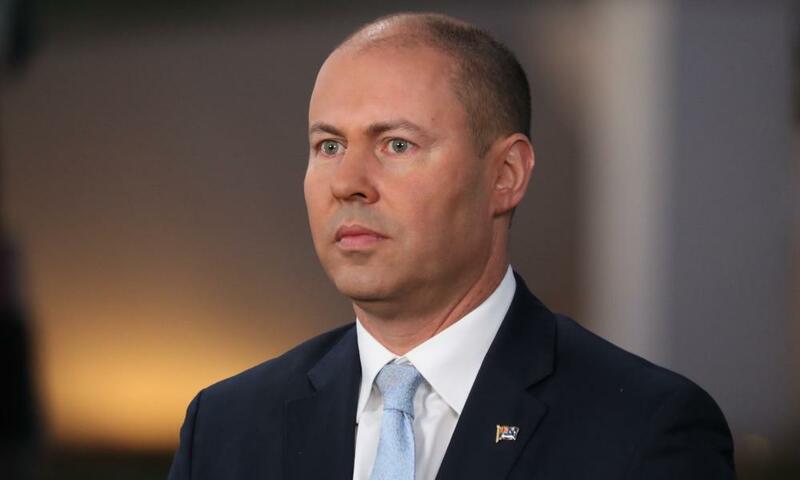 Speaking to Sabra Lane on ABC radio this morning, Josh Frydenberg announced the energy assistance payment, worth for singles and 5 for couples, will be made available to people on Newstart. That is new. Very new. When the government announced the payment, those on Newstart were left off, which was immediately criticised. And it was not part of the budget documents. The payment features on page 159 of budget paper 2, but in the list of people who qualify – age pensioners, carers, disability support pensioners, single parents, veterans and war widows, Newstart recipients have been left off. But in a pretty huge turn-around, Frydenberg said those on Newstart will now receive the payment. Anyone would think an election was just around the corner. The budget is done which means the election campaign has just begun. I can’t remember a time when the budget and election had such a compressed timetable before. And all it has done has just lent the budget an air of cynicism – it reads more like a campaign platform, than a serious economic document. Which, effectively, it is. But we still have some time until the election is officially called, which means there are motions to go through. Including today. The prime minister, treasurer and every other senior member of the government have been out since before the crack of dawn selling the budget, with just as many opposition and crossbenchers raising an eyebrow in its general direction. We’ll bring you all of that, plus everything else that happens in the dying days of the 45th parliament. Does anyone else feel like a decade has passed in these last few years? I mean, have you even stopped to think about what has happened in the time since Malcolm Turnbull called the double dissolution election in 2016? It’s insane. Absolutely insane. I’m interested to know what your enduring memories of this parliament will be, so hit us up in the comments. It might only be April, but the looming election has given this week a last day of school feel – and there are going to be many people in this building we don’t see again, once May ends. So hit us up with your memories. I’ll do my best to drop some into the blog as we continue with whatever these final days bring us. Mike Bowers, Katharine Murphy, Paul Karp and Gabrielle Chan are on board. As is the rest of the Guardian brains trust. We are all a little tired and cranky, but we have made it back after the day that was, so be gentle.